GameXplain took the liberty of color correcting and zooming in on the Zelda U footage from The Game Awards show last Friday. You can check out the original footage right here. 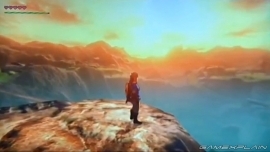 I speculated that this footage might relate the game to Skyward Sword, but that doesn’t inherently mean that the game takes place during that time period. We have even had fans breaking down the minimap and what that could all mean. We even talked about the possibility of multiplayer in Zelda U on this weekends podcast. We already covered how our own fans have been reacting to the new footage, but of course those reactions continue to pour in. Are you noticing any new details in the zoomed in footage?